Cloud computing has evoked a new hope among enterprises and businesses. Most of the entrepreneurs (including me) have begun to worry less about IT infrastructure. Well, all thanks to the Cloud! At present, serverless computing is the most-talked-about topic in this context. 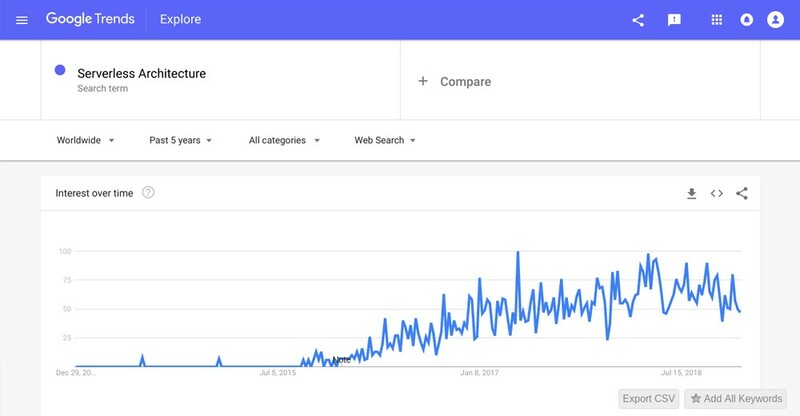 In Google Trends, we saw a huge spike in web searches on serverless architecture. A minimum of 100 web searches on serverless architecture occurs on a daily basis. So, why is there a sudden interest in serverless computing? Is it just a fad or indeed a game-changer? Let’s have a close look! To newbies, the term serverless would probably shock them. Does this mean there are no servers? Yes, and no. In such an architecture, your applications still run on servers. But, you don’t own or manage them. Like other Cloud models, you consume the computing architecture and pay only for it. Serverless computing services are available in two ways: Backend-as-a-Service (BaaS) and Function-as-a-Service (FaaS). Some providers offer database and storage services to customers or BaaS, while others offer functions without storing application data as the service. Some of the major FaaS vendors are Amazon — AWS Lambda, Microsoft — Azure Functions, Google — Google cloud functions, and IBM — IBM OpenWhisk. How Serverless Computing creates a difference in Your Business? Serverless and microservices architecture are quite similar in their characteristics. Both the architectures aim to improve business agility through its effectiveness. As we already know, a microservices architecture breaks down the entire application into loosely coupled services. How is it compatible with serverless computing? As the monoliths are diffused into individual services, it provides better virtualization of resources and an efficient API reusable environment. Hence, these independent services are placed in a better position to move serverless with its architecture. If you do not want to pay unwanted attention to infrastructure and functions, then you do have an option to go serverless with your microservices. Based on your application load and server requests, the architecture scales up or down within seconds. It understands the present scenario and adjusts itself to accommodate the rising infrastructure demands. In other words, serverless computing has a flexible event-driven scaling capability. An exceptional benefit offered by a serverless computing architecture is its low cost of maintenance. It works in the form of a pay-as-you-go model. You can not only save time buying infrastructure set up but also significantly reduces the cost of development. A micro-billing system enables you to pay for the executed code only. The cost is calculated based on memory and time consumptions. You needn’t have to pay for idle resources. As resource scaling is automatic and quick, operational costs are also significantly reduced for organizations. You have the freedom to roll out updates faster and get it reflected in a nick of time. In my opinion, when enterprises decide to go for a serverless architecture, they are offered better flexibility and productivity. Your development team can build, run as many tests as they want and release it in an agile manner. With the serverless computing, there are no concerns regarding infrastructure set up and its readiness to handle the updates. These requirements will be handled impeccably by the chosen serverless computing service. As the load on your team lightens, they can focus on other important things such as the application itself. Hence, we can definitely say that a serverless architecture improves the productivity of the team and enhances the quality of the application. Although serverless architecture gives you less control over the infrastructure, disaster recovery is fairly integrated into its services. Cloud-based disaster recovery services enable recovery of your critical enterprise apps without incurring additional costs. The servers are deployed on the Cloud, making it available during any hour of the day. So, if you have an issue in the middle of the night, you do not have to wait till the next day. The servers are available in various zones. In a nutshell, we can say that bringing down the recovery time to almost zero at fractional costs is your key outcome from serverless architecture. Serverless computing takes the burden off from our shoulders in many ways. Businesses can focus on core competencies rather than worrying about the build and its releases. The quality of services and products rise significantly along with team productivity. Resource scaling and micro-billing in serverless computing results in low-cost overheads. As the operational complexity reduces, the challenges to establishing a DevOps culture begin to diminish. Continuous Integration and Continuous Development (CI/CD) is indefinitely promoted in such a type of architecture where the code changes are automatically reflected in the application. Serverless computing has brought an enormous change in the application development world. I won’t be exaggerating if I said that it has eradicated most of the IT challenges. Because of the wide range of business benefits, serverless computing has evolved to be a major game-changer in the IT world. My personal favorite benefit out of serverless computing is its high scalability. In the ever-growing business world, we strive to accommodate the rising customer demands and industry trends. Hence, applications are always prone to updates and more data. So, if I get to expand my business ambitions higher with less hassle, then why should I hesitate! In the coming years, we can expect more companies moving forward with cloud computing and serverless architectures. At SayOne, we have already begun our voyage into the serverless world. If you need one, then feel free to speak to us! Serverless Computing — The Truth behind the New Business Trend was originally published in Hacker Noon on Medium, where people are continuing the conversation by highlighting and responding to this story.